Deliberately designed to make a big statement. Instantly upgrade the look of your garage or workshop with our 24-Gauge Bold Series Cabinets. The signature handle trim and sleek powder-coated paint finish work to give your space that flush look you've always wanted. The Bold Series comes ready-to-impress with stylish Jet Black frames and Charcoal Grey or Deep Red doors. A great addition to your garage or workshop, the 6 - Piece Bold 3.0 Series Cabinet set is made from 24 gauge steel fully welded frames and 24 gauge reinforced doors. The redesigned full length easy grab handles on the fully lockable doors offer a great modern look for any garage and the Sandtex paint finish will ensure the cabinets maintain their beautiful look for a lifetime. The floor cabinets come with 2" adjustable legs to keep cabinets level, or you may choose to mount the cabinets on the wall. Options include stainless steel or bamboo worktop. 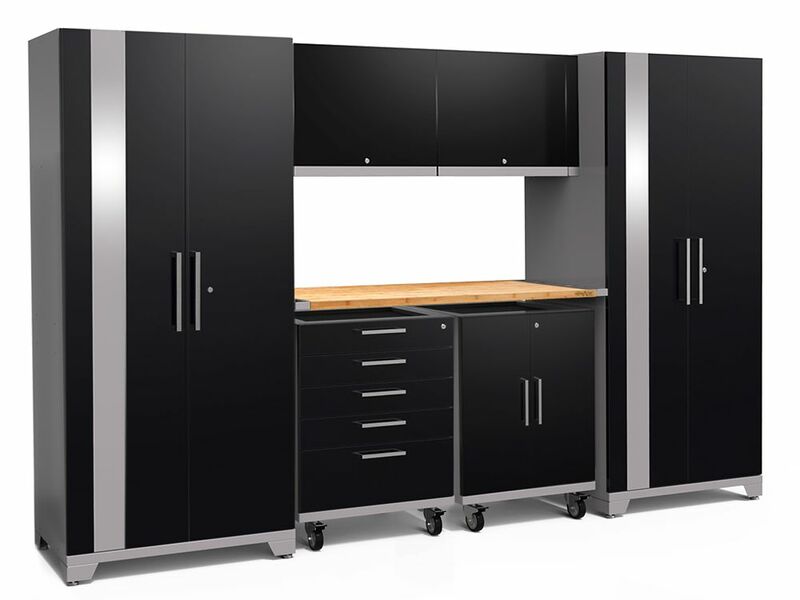 80-inch H x 133-inch W x 24-inch D Steel Garage Cabinet Set in Black (7-Piece) with Bamboo Worktop Bring your garage into the 21st century with our newly redesigned, Performance Plus 2.0 Series; our first fully mobile, modular garage cabinet series yet! Each cabinet features fully welded, 18 gauge steel frames with fully lockable double-walled doors; that's 100% stronger than our Performance Series! We've included soft-close door hinges, adjustable steel shelving, full extension drawers, integrated top tool trays on your base and tool cabinets and many more premium features. Our newly designed Mobile Spacer Kit allows you to change your once static garage set into a fully functional mobile set; with included casters, your base and tool cabinets can now slide in and out of your set with ease, leaving your worktop stationed. 80-inch H x 133-inch W x 24-inch D Steel Garage Cabinet Set in Black (7-Piece) with Bamboo Worktop is rated 5.0 out of 5 by 3. Rated 5 out of 5 by Happy customer from Great experience and quality delivery Everything arrived as expected. All the pieces were in great shape. The instructions were easy and everything went together without any issues. Very positive experience from the design process to the installation. The set looks great in the garage. Highly recommend New Age. Rated 5 out of 5 by Stephen from Better than Advertised Craftsmanship is better than I thought. Instructions clear. Worth every penny. Rated 5 out of 5 by JT from These cabinets are very high quality and well packaged. ... These cabinets are very high quality and well packaged. Be sure you have an extra person for uncreating and assembly. They are very heavy.